Figure 1. | The northern red oak orchard on the Cherokee National Forest provides a reliable and local seed source for reforestation and research throughout the Southern Region of the United States National Forest System. Many upland oak stands are currently dominated by oak species, but once harvested or otherwise disturbed, they regenerate to non-oak species such as yellow-poplar (Liriodendron tulipifera) or maple (Acer). This oak regeneration problem is pervasive throughout the southeastern United States, particularly on the most productive sites, and has caused concern among silviculturists, wildlife managers, and ecologists. Hard mast availability, timber value, and species diversity will be negatively affected if oaks decline in abundance. 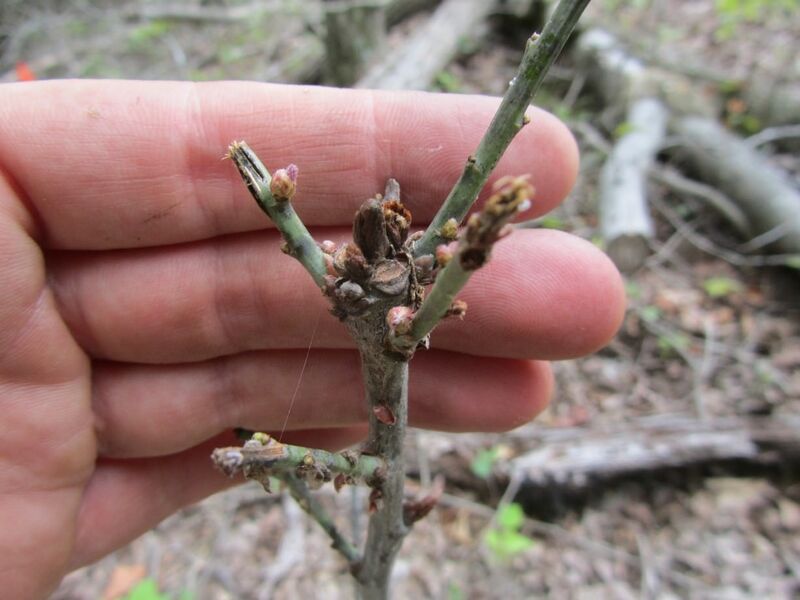 The goal of artificial regeneration research is to provide information and technology to forest managers to enhance, maintain, or restore the forest’s oak component through seedling planting. Our research focuses on upland hardwood forest species, primarily northern red oak (Quercus rubra) and white oak (Q. alba). Figure 2. | 1-0 (one year old) northern red oak seedlings growing in a commercial tree nursery using advanced fertilization and irrigation protocols. Artificial regeneration of oak is largely undomesticated and much more difficult compared to pine species. While oaks have been planted since colonial days, successful plantings are rare. Failures have been primarily attributed to poor planting practices, poor seedling quality, animal damage to seedlings, and the inability of planted seedlings to compete with natural vegetation on site. Most plantings have been conducted using unknown seed sources that may not be well adapted to the planting area. For decades, managers planted relatively small seedlings from the nursery, leading to planting failures because seedlings can’t escape animal browse and are quickly overtopped by other vegetation. In the 1990s, USDA Forest Service scientist Paul Kormanik developed a strict fertilization and irrigation regime for oaks that revolutionized oak planting on sites where failure was once guaranteed. Using this regime, a good portion of northern red oak seedlings from any seed lot can attain 4 feet in height after one year in the nursery (Figure 2). We have a memorandum of understanding with the University of Tennessee’s Tree Improvement Program (UT-TIP) and the Southern Region of the National Forest System to test genetic material from UT-TIP or Forest Service seed orchards on National Forest System lands. We ensure genetic identity is maintained throughout studies and variation associated with genetics can be estimated. The oldest oak orchard in the country is on the Cherokee National Forest, and we have used seed from this orchard for most of our northern red oak research (Figure 1). Our research has three primary components: 1) Testing genetic effects and variation on seedling development, 2) Testing cultural practices in the nursery or just prior to planting on seedling quality, and 3) Testing forest management practices such as harvesting, prescribed fire, or herbicide on seedling development. We also test interactions between these three components. Figure 3. 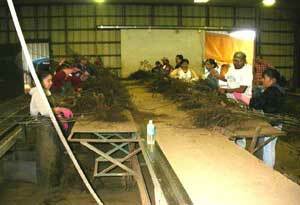 | Nursery workers grade oak seedlings using the root collar as the primary grading characteristic. 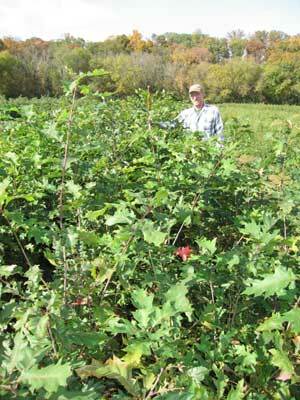 Oaks are highly variable in seedling quality coming out of the nursery despite using advanced nursery protocols. We have several studies testing methods to reduce seedling quality variation, including testing effects of acorn size and weight on seedling quality, effects of top-clipping, and visually grading seedlings. After the seedlings are lifted from the nursery, nursery workers can grade the seedlings for quality using size of the root collar or seedling height (Figure 3). Generally, planting bigger seedlings results in faster growth and mast production. The ‘ideal’ oak seedling from a bare-root nursery, however, should not exceed approximately 4 feet in height unless it also has a substantial root system. The ratio of biomass in the root compared to the shoot (root to shoot ratio, R:S) can be out of balance for larger trees. If the R:S is too low, the tree will experience prolonged planting shock that may even result in mortality. Figure 4. | Repeated deer browse can reduce growth and survival. Seedlings produced using advanced nursery protocols can be easily separated into two or more grades. Those in the highest quality grade were the largest at planting and continued to have the best growth for several years following an exceptional drought. Managers can match seedling size to site characteristics, reserving the best seedlings for the best sites or areas where fast mast production is desired. Larger seedlings could also be used in areas with high deer populations to avoid deer browsing on seedlings less than 4.5 feet in height (Figure 4). Once seedlings are planted, they may need to be released from competing vegetation (Figure 5), but the timing of these treatments are important. Competition control can be expensive, and may not be effective if applied too early or too late after planting. We have recently installed a study to test the use of herbicides prior to and after planting to reduce natural vegetation competition. 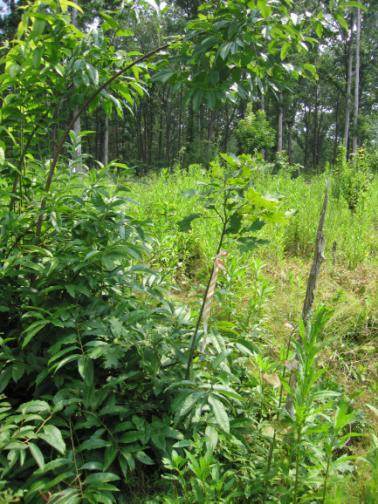 We have several studies to test silvicultural prescriptions for planting oak seedlings. Results indicate that oaks do best in areas treated with a regeneration harvest, but they can also survive in areas that are unharvested if they had been burned prior to planting, Seedlings did not perform well when planted in unharvested areas treated with a midstory herbicide removal. Figure 5. | A northern red oak seedling (with flagging) needs release soon because it grows beneath the shade of a black gum sprout. Clark, S.L., S.E. Schlarbaum, and P.P. Kormanik. 2000. Visual Grading and Quality of 1-0 Northern Red Oak Seedlings. Southern Journal of Applied Forestry 24:93-97. Loftis, D.L. 1979. 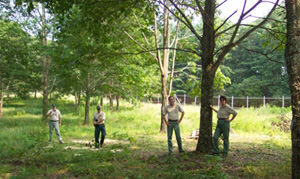 Northern red oak performs poorly in North Carolina planting. USDA Forest Service Research Note SE-277. For more information contact Stacy Clark at stacyclark@fs.fed.us or at 865-974-0932, or Marty Spetich at 501-623-1180 ext 105.